What’s the next logical step for the passionate beer experts behind the two-decades-old Brick Store Pub in Decatur? 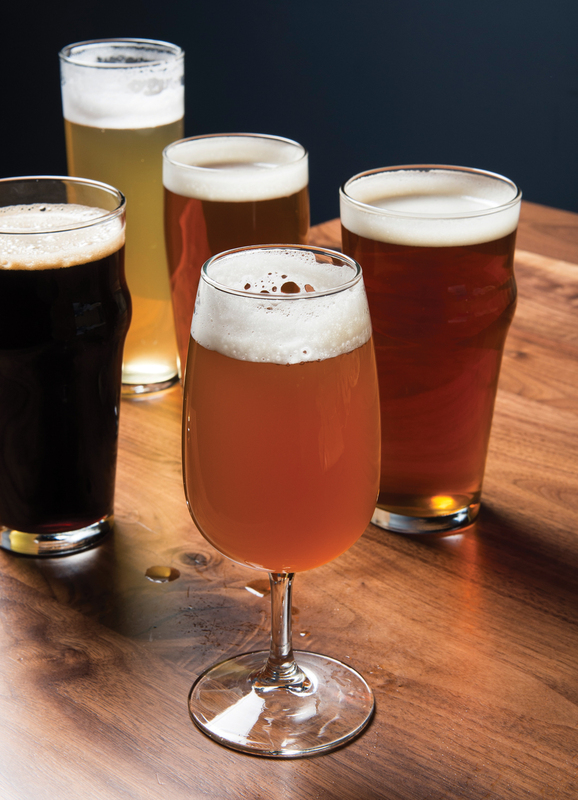 How about a revolutionary brewpub engineered for conversation and focused on community in what’s perhaps the region’s next big destination for hip eating and drinking: Duluth. 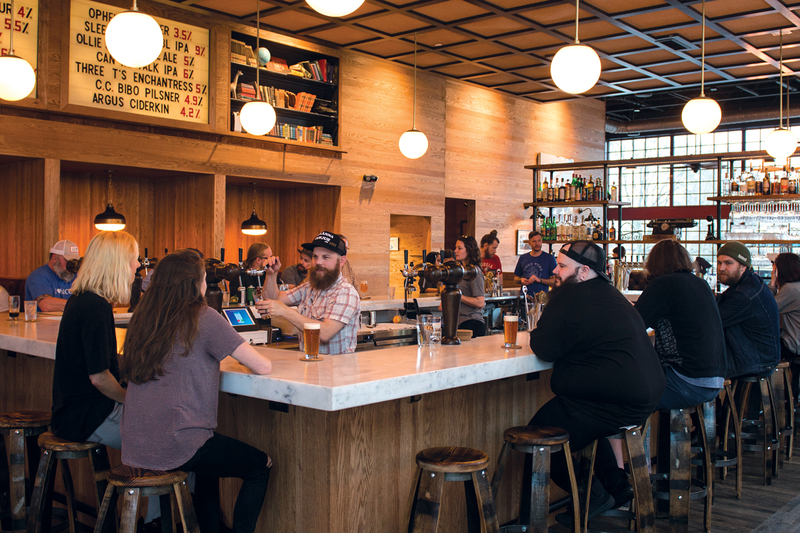 With a 2,000-square-foot state-of-the-art brewery on one side and, on the other, a 5,500-square-foot restaurant, Good Word’s gorgeously designed space possesses vintage charm without coming off as gimmicky. You’ll find old books and ancient typewriters rather than televisions, and the throwback mood manages to suit the newly developed Parsons Alley’s complex. The location might be a hike for some Brick Store enthusiasts, but the beer and the food are worth it. The Brick Store Pub’s former general manager, Todd DiMatteo, and former beer buyer and certified cicerone, Ryan Skinner, have made the jump to Good Word, and Brick Store founders Dave Blanchard, Mike Gallagher, and Tom Moore (the trio also helped launch Kimball House and Leon’s Full Service) are the co-owners, along with Andrew Case. Head brewer Kyle Jeppesen came to Good Word from Canada, armed with a food science degree and more than five years of experience working for breweries there. 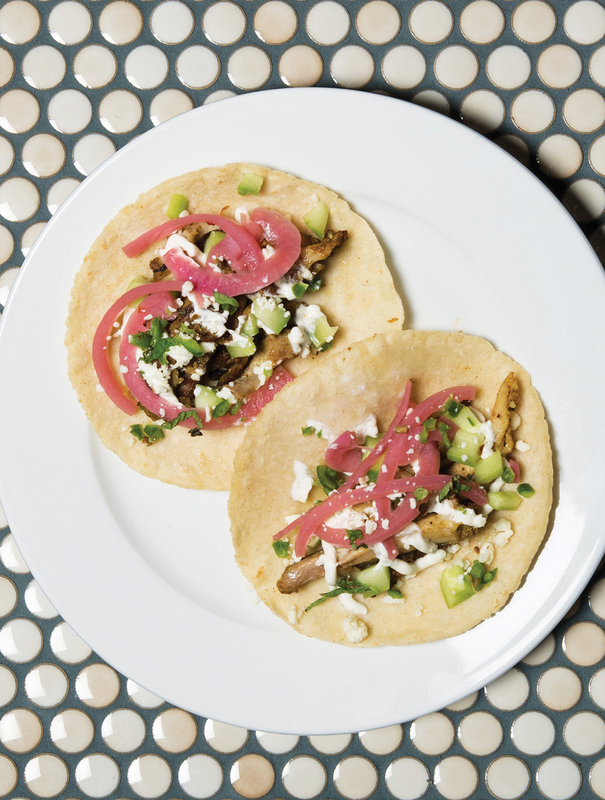 Tacos are served on fragrant, fresh-pressed tortillas. The food at Good Word is unsurprisingly beer-friendly and surprisingly multicultural; the small menu is filled with Puerto Rican and Southern twists, some a little more forced than others. DiMatteo’s grandmother, Maria Esther Pena, moved from Puerto Rico to the South in the early 1950s and learned to cook Southern food from her mother-in-law. Pena is the inspiration for Good Word’s occasional Puerto Rican fried chicken special (coated with hot spices, cooked sous-vide for three hours, then fried in cornmeal), its pernil (a tender braised pork belly served with Carolina Gold rice and Sea Island red peas), and its somewhat awkwardly crumbly flan redolent of burnt sugar and cajeta. Tacos are made with thick, fragrant corn tortillas pressed in the kitchen every day and stuffed with fried catfish, charred cabbage, and buttermilk sauce, or with barbacoa chicken, crispy chicken skin, and peanut salsa. The slightly too-thick corn chips, also made in-house, are a vehicle for bright, citrusy guacamole. Fun, shareable plates include a giant empanada with a thick, dark chocolate mole. You’ll find between eight and 12 in-house beers on tap, such as the Weak Fantasy Imperial IPA (center). The most important thing about the brewery? Its ability to achieve balance in its beers. You can expect between eight and 12 in-house brews on tap, plus a couple from breweries Good Word considers friends (currently Argus and Creature Comforts). Exceptionally fresh, sessionable beers such as the Rocksteady (a quaffable English Mild with notes of toasted bread) and the Be Bop (a not-too-bitter E.S.B.) are among the most approachable of Good Word’s brews, but everything from the Bridges (a balanced, hoppy sour) to the handful of American IPAs (impeccably clean, with minimal funk) proves that this is a first-rate brewery. Better yet, all the beers (with the exception of the stout) are just $5. Good Word also sells four-packs of house-canned Crowlers (part can, part growler). The giant brick building that houses Good Word is new construction, but you wouldn’t know by looking at it; across from a row of quaint older buildings, it fits right in. The interior design, by Square Feet Studio, is illuminated by a spectacular bank of windows, and the dining room is anchored by a white marble bar and custom-made draft towers fast acquiring a much-desired patina. The floors are reclaimed wood from a 100-year-old train yard, and the lighting evokes a library, adding to the calm of a social space designed for comfort. While it’s still a work in progress, Good Word has quickly established itself as a place that worships quality beer, playful food, and old-fashioned hospitality.